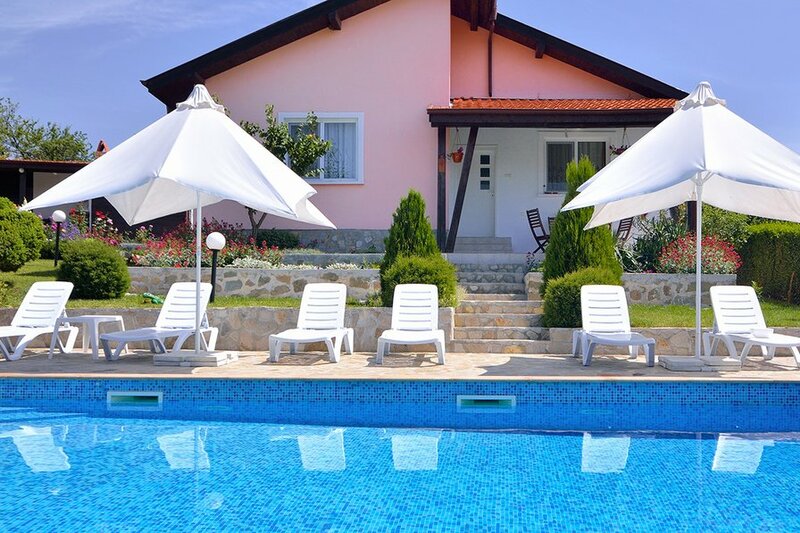 Two self-catered villas (3 bedroom each, total sleep 12) close to Sunny Beach from the owner. Fully equipped kitchen. Bed linen, towels & sun beds provided. Private swimming pool (9 x 5 meters for sole use) , covered BBQ with dining area, kids playground. Both villas are identical. Prices shown are for both villas (sleeps 12)!!! Comfortable and modernized house in Bryastovets. With garden of 1000 m2, ideal for a holiday with family or friends. The houses have one floor. In each house there are 3 bedrooms, two bathrooms, a living room and a spacious dining room with a nice kitchen with all modern facilities . In the garden you can sunbathe peacefully and enjoy a snack or dinner at the BBQ – it is a standalone covered BBQ with cooking and dining facilities. The house facilities are suitable for 6-7 people. Two wonderful villas with their own Swimming pool. The two villas are modern (and well equipped with the latest items to make sure your holiday break is as perfect as possible. Bulgaria is a wonderful location for the whole family to enjoy a fantastic holiday away. The climate is excellent so you can go all summer round and virtually be guaranteed to have wall to wall sunshine. There are lots of fantastic beaches, small towns and villages to explore and the people are very friendly. If you are looking for a holiday rental then there can be nothing better than enjoying time away in “ROYAL VILLAS”, a brand new small privately owned and EXCLUSIVE accommodation of two villas only with their own swimming pool. “Royal Villas” make for the perfect break for both families and friends, they will give you everything you need to have a relaxing and enjoyable break.